This post was updated 12/21/18. Reptiland is the answer to your last-minute shopping needs! Open 7 days a week for your convenience, we’ve got plenty of awesome in-store options. We also have gifts that can be purchased over the phone, mailed directly to the recipient, and emailed! Promote the animal lover in your life to Zoo Parent! When you purchase an adoption package, you are contributing to the daily care of our animals as well as our conservation efforts. And with 10 different animals and 5 packages to choose from, you can customize this gift to your needs! The Natural Selections Gift Shop boasts a one-of-a-kind selection of merchandise. In addition to educational toys, books, and other fun gifts for kids, we also carry unique, fair-trade gifts from around the world. These handmade items include jewelry, baskets, ornaments, purses, trinkets, and much more. And of course, we’ve also got plenty of novelty and souvenir items for the zoo lover in your life! We’re open 10am to 5pm every day through and including Christmas Eve, so stop in and see us. Our staff is happy to help you choose the perfect gift for anyone left on your list! BONUS: Save 20% on all gift shop purchases of $25+ through December 31, 2018! The most versatile gift of all time, gift cards are great because they let the recipients choose. 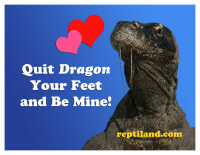 Here are a few ways to spend a Reptiland gift card. or just come to the zoo for fun day filled with fascinating animals and live shows! Gift cards can be purchased via phone and mailed directly to the recipient. If you’re really short on time, we’ll even create and email a custom print-out that you can wrap and give to the recipient until the real deal arrives. The bottom line is, we’re here to help! With a wide range of educational options, one-of-a-kind gift items, and interactive zoo experiences, we’re certain you can find a gift for that hard-to-buy-for person on your list—and quick! Come to Clyde Peeling’s Reptiland for the personalized service and meaningful gifts you won’t find at big-box stores.